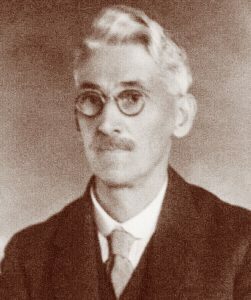 Herbert Thomas Slatter sails from England with his wife and three children. Arriving in Melbourne in 1874, he establishes Slatters. The company archives still include H T Slatter’s original shipping ticket and hand-written record books, which date to the late 1800’s. Records of business transactions, with C and J Clarks in the U.K, (later to become Clarks Shoes). Over time, H T Slatter is joined by his two sons, J C (Joe) and H H (Hal). 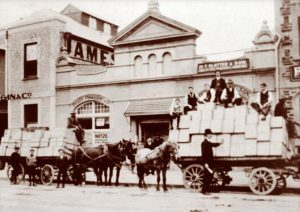 Hal Slatter, the younger brother of Joe, endeavors to expand the Slatters business by travelling to South Australia and he establishes an Adelaide based office in 1901. 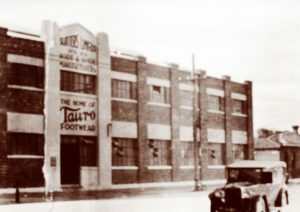 South Australian based manufacturing commences in 1916 in a small Flinders Street factory. 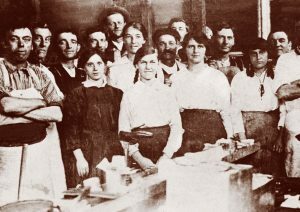 Picture shows a few of the original employees of the Flinders Street Factory. 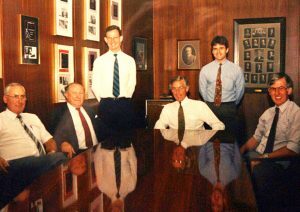 Hal Slatter passes away and H T (Bert), eldest of his four sons, assumed the role of Managing Director. D S (Dudley) Slatter joins Bert, followed by B H (Brian) and R (Bob). Manufacturing continues to grow at Flinders Street but it soon becomes clear, that in order to progress, larger premises will have to be located and secured. 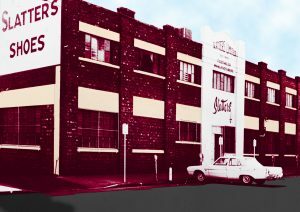 Slatters acquires a city acre site on Halifax Street in Adelaide. 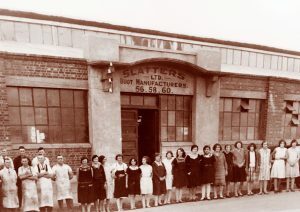 A new factory is commissioned and built and soon after completion the manufacturing is transferred from Flinders Street in 1931. Slatters goes from strength to strength and after 7 years in Halifax Street plans to expand the building are drawn up and building work is commissioned. A second storey is added to the new building for administration and warehousing. Slatters have been going strong for 65 years and have grown into an Australian Icon. 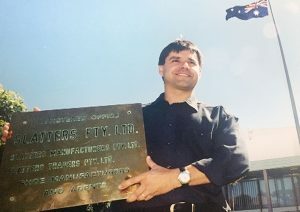 Over the coming years as War breaks out all over the World, the company becomes a major supplier to the Australian Military producing 600,000 pairs of Boots for the Troops. Change arrives in the 1970’s: traditional ‘welted’ construction is replaced by “cement lasted” construction. Bob Slatter’s son, John Slatter, is appointed as Managing Director in 1977. John had lived in England for four years in the late 1950’s and early 1960’s, having completed a degree in shoe making at the British Boot and Shoe Institute. Trevor Haines begins working as a warehouse trainee. In 1982 Paul Haines (Trevor’s Brother) is appointed as a sales cadet. 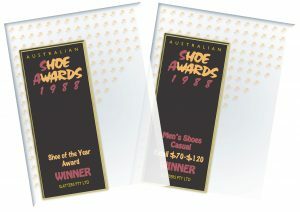 Slatters win multiple shoe Awards and become the first men’s brand to take the Industry’s top award (Shoe Of The Year). Slatters Market share increases and production rises to approx. 10,000 pairs per week. Trevor Haines is appointed financial controller in 1995 and in 1997 Paul Haines is appointed Managing Director after John Slatter steps down. John continues with the company as Chairman. 2007 sees John Slatter retire in December due to ill health. 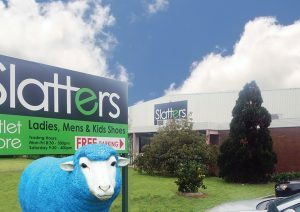 Slatters acquire Blue Sheep Ugg Boots (Est.1967) manufacturing of Quality Ugg Boots commences & continues to this day in Findon. 2012: The Federal Government’s tariff reduction results in production of Slatters Men’s Shoes moving offshore. The Slatter’s range expands thanks to improvements made to designs, fit, and specifications. Over 140 Years after it was founded Slatters furnishes the world with quality Men’s shoes. An Australian Owned industry leader.